New Nationwide Campaign Demands: LGBT Rights Be Added to 1964 Civil Rights Act. New Nationwide Campaign Demands that LGBT Rights be added to the 1964 Civil Rights Act. Vigil June 30th @ MLK Memorial Will Launch Campaign. The LGBT Equality Pledge Network – a new nationwide campaign for full LGBT (lesbian, gay, bisexual, and transgender) equality backed by over 240 organizations – will officially launch with an LGBT Civil Rights Vigil at the Martin Luther King Jr. Memorial in D.C. beginning at 8:30pm, Monday, June 30th. 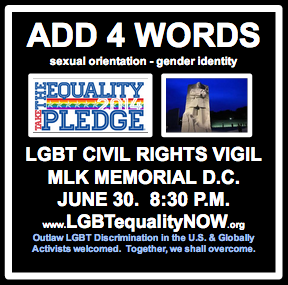 the event theme is “Add 4 Words” reflecting a call for four words to be added to the 1964 Civil Rights Act: “sexual orientation – gender identity” (SO-GI). The event also celebrates the 50th Anniversary of the Act, on July 2nd, marking 50 years and counting until the day LGBT Americans are equally protected from the scourge of discrimination. A new organization, www.LGBTequalityNOW.org, has been created to facilitate the Network, led by a wealth of veteran experience and diversity, including Erica Keppler, Chair of the Arizona Stonewall Democrats; Cathy Marino-Thomas, former chair of Marriage Equality USA; Veronica Eady, a straight-ally and African-American civil rights attorney currently at the Conservation Law Foundation; Josef Pons de Jesus previously with ACT-UP New York, Human Rights Campaign, and the National Latino Lesbian & Gay Organization; Pablo Colon, former community outreach and advocacy director at the Gay Men’s Health Crisis New York; Attorney Yetta Kurland, former candidate for City Council in New York City and a human rights advocate; Michael Miller, formerly with the AIDS Action Committee of Boston and Harvard AIDS Institute; and Executive Director and Board Chairperson, J. Todd Fernandez, Esquire, former Ombudsman to the Governor and General Council and Legislative Director for Economic Affairs of Massachusetts. Building a powerful team, the new network is uniting the grassroots and state groups like never before, breaking the corporate insider mold with direct empowerment of local expects. Over 40 activists in 22 states are serving as volunteer state leads, including Attorney Peter Sergienko working with his gay son Eugene in Oregon; Richard Noble, from the Walk Across America; Attorney Stephen Zollman of the National Equality March; Jeff White-Perkins from Mississippi Gulf Coast Rainbow Center; straight-ally Jean Kryean of Pennsylvanian, and Mika Covington and Ken Riter, who have joined forces in Iowa and Nebraska (quotes below). The unifying statement of principle for the over 240 groups in 44 states is the Pledge for Full LGBT Equality, which calls on the LGBT Caucus to file a one-bill strategy to add SO-GI to all the civil rights laws at once. The breadth of this community mandate spans sixteen statewide equality organizations from Equality Hawaii to Equality Illinois to Equality South Carolina; transgender groups such as Gender Rights Maryland and the Tennessee Trans Political Alliance; People of Color groups including LGBT Caribbean and the NYC Black Justice Alliance; PFLAG chapter from Pasadena to Ann Arbor; the ACLU of Mississippi, the Unitarian Universalists Association; Metropolitan Community Churches; the United Church of Christ; LGBT Democrats of Virginia, Palm Springs and Florida, 23 LGBT Community Centers from New York to San Francisco; LGBT Pride groups from New Orleans to Los Angeles to the Outer Banks; and InterPride, and over 11 City Council Proclamations from West Hollywood to New Orleans and Tallahassee. The new strategy is in sharp contrast to the Human Rights Campaign’s push for the Employment Non-Discrimination Act, now embroiled in community dissent because of the religious-exemptions that would leave our most vulnerable children behind. Groups including the ACLU, Lambda Legal, Equality California, Queer Nation, Equality Illinois, and others, strongly oppose the Senate version of ENDA, which would ensconce in federal law anti-LGBT discrimination in taxpayer-funded programs, as a concession for Republican votes, that entirely misses the point of organizing for social change. The Network’s information-filled website advances two main arguments: 1. That international law requires Congress to outlaw SO-GI discrimination, and 2. that the vast harm caused by discrimination, known as “minority stress,” makes this a public health emergency. As support, the site includes the United Nation’s Free & Equal campaign, the historic speech by former Secretary of State Hillary Clinton proclaiming “gay rights are human rights,” and congressional expert testimony of Dr. Illan Meyers of the Williams Institute, backed by official reports of the United States Civil Rights Commission, the American Psychological Association, and others. The 2014 Campaign goals include 1. Increasing Pledge support from 245 to 500 organizations, 2. Establishing state leads in all 50 states, 3. Conducting a 2014 Equality Poll to map support in Congress, and 4. Mounting a PSA campaign about “minority stress” impact including suicide and mental health disparities, such as depression, anxiety, and hypervigilance. LGBT Americans are suffering from these, unaware that societal discrimination is the cause, and this simple awareness could save lives and prevent suffering, while changing hearts and minds. The vigil will feature pictures of LGBT Americans lost to suicide and murder, also honored on the website, to prevail upon the greater conscious of our nation to outlaw this societal abuse. Activists and religious leaders will carry rainbow falgas and herald the contributions of LGBT civil rights heroes Eleanor Roosevelt, who led the way on the Universal Declaration on Human Rights, and Bayard Rustin, the gay human rights leader who was posthumously awarded the Presidential Medal of Freedom for his work leading to the passage of the 1694 Civil Rights Act, which his community yearns to join. Next Vote Blue in 2014! Vote for Change!